But, what seems to have caught the eye of her loyal followers is the presence of a certain ~man~ in several of her posts. And he’s none other than President-elect Rodrigo Duterte’s youngest son (aka the man of many women’s dreams) Sebastian ‘Baste’ Duterte. Of course, these posts wouldn’t go unnoticed by Ellen and Baste’s many, many fans. The question many have asked is, "Are they together?!" Ellen, who’s known and loved for being unapologetically frank, addressed the romance rumors linking her to Baste. Posting on IG (well, DUH), Ellen is pictured beside the political scion holding a chalkboard with the words "Slow Down" written on it. 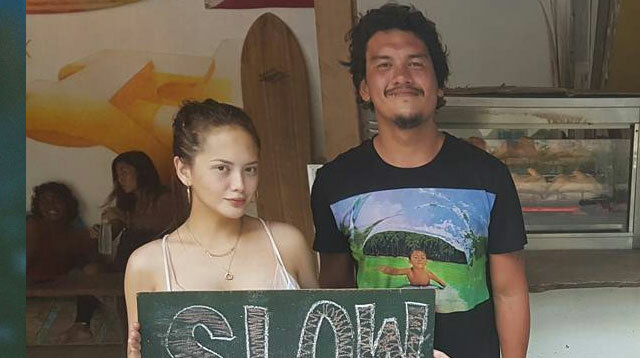 ICYDK, Baste recently opened up about his relationship status, stating that his current GF is the mother of his second child.